This year is turning into the year of the campaign! I decided that I wanted to rebalance my painting and playing as I was finding I had many miniatures painted that had seen very little tabletop time. Don’t get me wrong, I enjoy painting in its own right, but upon reflection I didn’t think I was getting as much value out of my painted miniatures as I could be. Having grown a little jaded with competitive play after playing on the Warhammer Fantasy scene for years I didn’t want the same thing to happen with Warmachine/Hordes. Enter The Orgoth Legacy, a narrative campaign arc to carry my Warmachine gaming for (at least the early part of) this year. It all began with an opportunistic campaign that I played with Clay and Dan in Orlando late last year called Scourge Bringer. The idea of the narrative campaign is simple – every campaign, a sequence of at least a few games would carry the story forward a little. Scourge Bringer began it all with a mad scramble between three powerful warlocks/warcasters for pieces of a powerful Orgoth Weapon, the Scourge Bringer. Thagrosh and the Legion of Everblight won out after three hard fought games and won this dubious prize. Dubious for it is a weapon, that once assembled, has the power to slay a dragon. 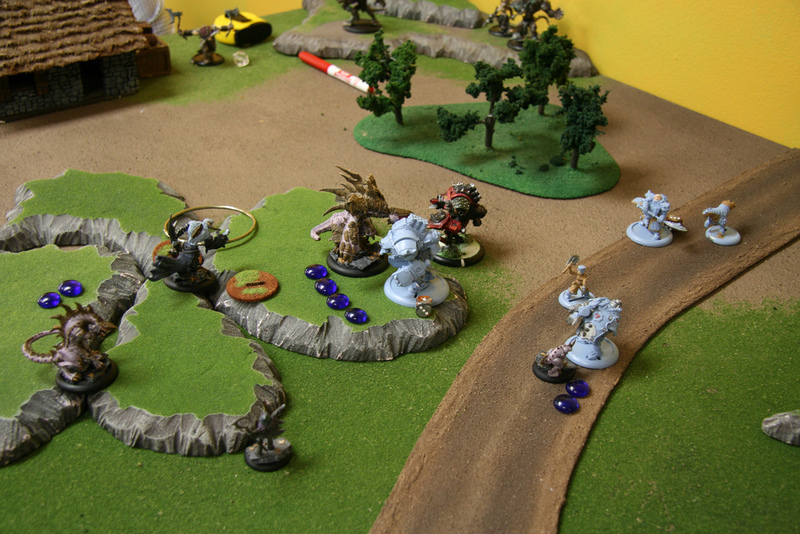 As Everblight is still gathering strength he ordered his minions to keep the weapon pieces separate and keep them safe. To that end Vayl spawned three unique beasts in the Shard Spires (Northern Khador) and installed a weapon piece in each. These bestial vessels were continuous eroded by the weapon, but were designed to regenerate rapidly. For additional security each beast was frozen in the core of a glacier, but before the final beast named Vylodectes could be entombed the Legion were set upon by the audacious Cryx. Enter the Frozen North campaign, a part of the Cryxian Ambition arc. 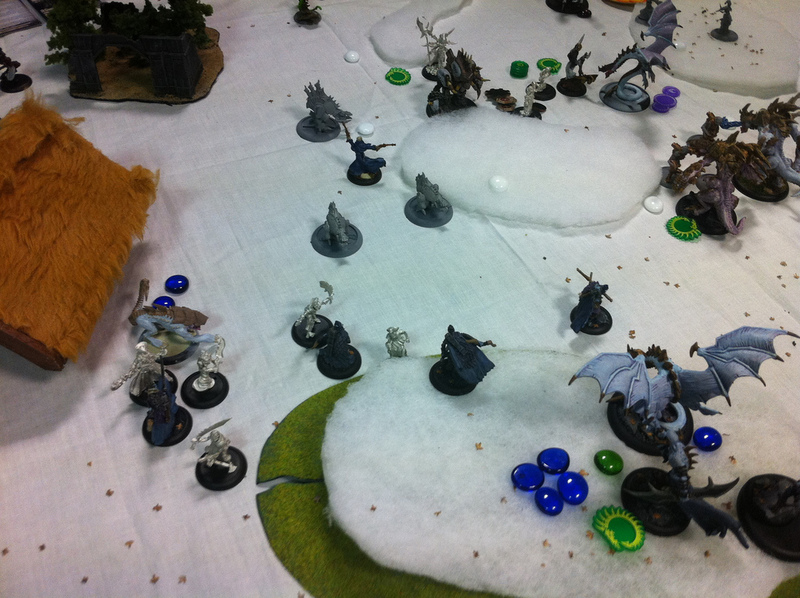 The forces of Cryx clashed with the spawned beasts initially resulting in a vicious stalemate. However, the Nightmare Empire overcame the Legion forces, destroying Vylodectes and seizing the weapon. Traveling through Khador is hazardous and the Cryxians have clashed with Pirates (The Landing), Trollbloods (Flanking Move) and finally each other (Power Struggle; yet to be played). The great draconic powers now possessed pieces of this most dangerous weapon. However, Legion and Cryx aren’t the only factions with an interest in the Scourge Bringer. Recently the religious zealots from the Protectorate of Menoth have begun moving into Southern Khador as they begin moving towards what they view to be an abominable creation. They seek to use the power of their creator to purge the Scourge Bringer from Caen. The interests of the enigmatic Skorne are less easy to decipher. They have clashed with the forces of Legion as they too show their interest in the ancient weapon. Here’s a breakdown of the games played to date. So, the campaigns are progressing well and I’m getting lots of games played. Once the Cryxian Ambition arc is finished I’ll figure out where the story can go next.